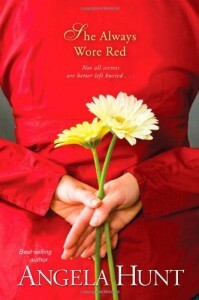 She Always Wore Red by Angela Hunt is the second book in the Fairlawn trilogy but can be read as a stand-alone. I however enjoyed meeting up with familiar characters and some new ones too. It is a contemporary Christian novel set in and around Fairlawn funeral home. She Always Wore Red is a compulsive read. It made me laugh and it made me cry. And along with the characters, it strengthened my faith. A major theme in the novel is that of prayer. Prayer is powerful as it connects us to God. But what happens when we pray and God says no? “She taught me how to thank God for unanswered prayers… because when God says no, I have to trust that His ways are perfect.” Prayer has to be tied in to trust in God. We have to trust even when we do not understand. And we have to realise that God is God and we are not. Tied in to prayer and trust is that of faith. Faith in a God who loves us. Faith that even when life is tough, we know that God is with us. Faith plus prayer plus trust is an excellent recipe for life. “I have learned that prayer changes us… faith conquers fear.” Keeping one’s eyes fixed on God is necessary to dispel fear. The novel deals with racism and prejudice. It is horrifying to see that in the twenty first century there are still people who cannot see beyond the colour of someone’s skin. We need to look into a person’s eyes and heart and see them as God sees them. There are no divisions in God’s world. We are all created equal. Characters within the novel try to build bridges and open the eyes of others but for some racism is deeply engrained in their hearts. It blinds them to all else and it cuts them off from loving relationships. Angela Hunt tackles the difficult and heart wrenching areas of abortion, premature babies and disabilities. God does not make mistakes and every life is precious to Him. The baby in the womb is loved by God and has a right to life. All life is sacred. It is not ours to throw away. Within the novel is love which covers all. Love is an action and the most important action that we can do. “You don’t have to support her decision, you only have to love her.” We may not always agree with actions of lifestyle choices of others but our job is not to judge. Our job is to love. Forgiveness is another theme within the novel. Sometimes the sins of the past are revealed in the present. Sometimes the perpetrator of the sin is dead. Whatever the situation forgiveness needs to happen in one’s heart. Tied in to this theme is the sins of the fathers. Children cannot be blamed for their fathers poor choices. Children are innocent victims and need to be loved as such. As with book one, the characters are all very likeable and well drawn. Their personalities become even more developed in this second book, and the reader gets to know them better. The reader also learns rather more about the process after death as Jen, the owner of Fairlawn is doing an embalming course! I am really enjoying this Fairlawn trilogy and cannot wait to read the final book. Angela Hunt is an entertaining writer who both educates the reader and creates a bond between the reader and the characters. Give yourself a treat and buy the Fairlawn trilogy, escape for a few hours and make some new friends along the way.